A while back, on a trip to Kalustyan's to pick up some ingredients for bitters (more on that anon), I was pleased to note that they carried some of the Trader Tiki line of syrups. Trader Tiki aka Blair Reynolds, as you'll recall from my visit to Portland, is an accessible, enthusiastic tiki maven who's on a crusade to share his love for all things rum-based to the world at large. Tiki drinks are a kingdom that I don't have a whole lot of knowledge about -- though it's certainly fun to learn -- so I decided to pick up some Don's Mix and some orgeat. The Don's Mix is a bewitching combination of cinnamon and grapefruit syrups, and seems like it could go well with lots of things, including maybe some drinks normally outside the tiki kingdom. (For instance, I could see an interesting tequila cocktail built around these flavors.) 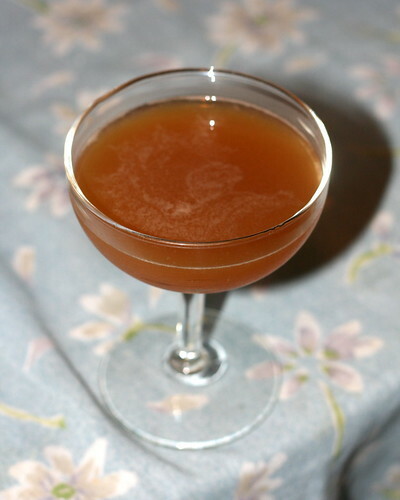 And it makes for a nice and quick rum punch, as the bottle recommends; a splash mixed with rum, lime, and perhaps orange bitters -- a modified version of the Baguio Skin from Charles Baker's Gentleman's Companion -- is fast and unbelievably refreshing. But what to do with the orgeat? This milky-white almond- and apricot-kernel-derived syrup is an ingredient that suggests much fewer immediately obvious uses to me (aside from the truly great Mai Tai and a host of other tropical drinks, most of which I haven't tried), but the nutty flavor is rich and powerful. What to do? Enter my girlfriend Bari (who you may remember as having collaborated with me on the Japonais last year.) She used to be a barista, and said that she would often mix Torani orgeat into tea, and that customers always loved it. Eureka! I never would have thought of the combination of almonds and black tea, but it really does work. The natural choice for an orgeat drink would be rum, of course, so I reached for my bottle of Pyrat. This rum, made by the folks who make Patrón tequila and Citronge orange liqueur, is on the sweet side but a little funky and very orangey. (They also seem to have reformulated it and moved their production, which I discovered on picking up a new bottle recently: my old bottle of it was made in Anguilla, while the new one -- which is sweeter and less complex, alas -- was made in Guyana.) So why not add more citrus to the mix and bring in Earl Grey, my favorite tea? Earl Grey is flavored with oil of bergamot (my preferred variety is actually the Stash Double Bergamot Earl Grey, since it turns the bergamot control up to 11), and it married nicely with the rum. And what goes with rum? Lime! So lime juice has gotta go into this as well. So, you going to submit that to the contest? If you've got the Don's Mix and some rhum agricole, be sure to go for a Donga Punch. It's one of the simplest, but also one of the best, tiki cocktails around.